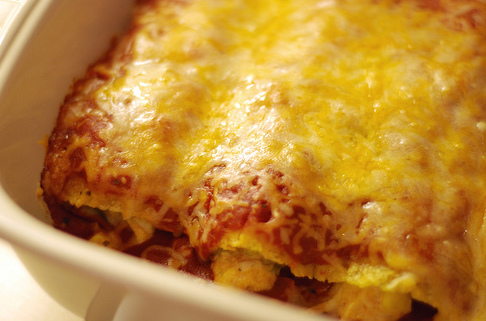 This is a great easy Chicken Enchiladas recipe all the way from deepest darkest Mexico so it's pretty authentic. Maybe it has been altered a little in the last few weeks just to keep it simple but still, it's pretty damn good! Skin and de-bone the chicken breasts and then season them with the chilli powder, salt and black pepper. Put them under the grill turning occasianally untill they are cooked. Now chop them into small strips. Now you need to mix the cream cheese with the chicken, you may find this easier to do if you chop up the cream cheese first of all. The chicken should still be hot so the crream cheese should start to melt. When it has add half of the cup of salsa. Turn the grill of and put the tortillais in the gril just to warm up (not to cook). Pour the chicken and salsa mix into the tortillas and wrap them up nice and tightly. Place them intoa large casserole dish in such a manner that they do not open. Ok, mix the salsa and and sour cream together in a serperate bowl and then spread over the top of the enchiladas. Cover with about 3/4 of the melted cheese and some salt and pepper. Put in a preheated oven at 180 C untill all of the cheese has melted and turned a nice golden brown colour.